Strawman fallacies are a form of argument based on a misrepresentation of the opposing argument. Nobody said that Well of Discovery was better than Ancestral Recall . What Akros said was that consistent draw was typically better than burst. 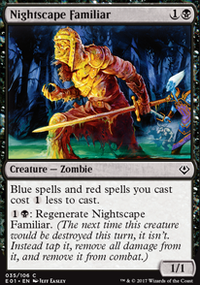 You are the one who chose to use a strictly worse version of Staff of Nin , also a bad card, as the poster-child of consistent draw. I have been playing EDH for five years and had never even heard of Well of Discovery until now. It's literal jank. It's like me saying "so you're saying Accumulated Knowledge is better than Necropotence , then?" Now, I don't know why I bothered arguing that anyway, since Recall is banned, and your argument was therefore ridiculous anyway. But I did and it's over now. Onto your next point. Yes, Phyrexian Arena has nothing on Rhystic Study . But it's in black. Sometimes you're running and you just gotta use draw spells that aren't the best draw spells in the game. Given the available options outside of blue, I'd say Arena fits well enough in those decks. You should play with 20 or 22 Island and put some draws. Maybe Accumulated Knowledge , Mulldrifter or some cantrips. And I don't think that Write into Being is a good card in this deck. If you're looking to make this Modern Legal, Give / Take is great in place of Deepglow Skate . And like Cicjose mention, Growth Spiral would slot in for Accumulated Knowledge . I find this build really clunky. Vulshok Morningstar is quite expensive, especially when you want to leave mana up for counter. 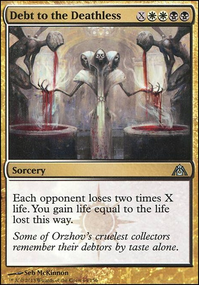 2 point in toughness is nice vs Lightning Bolt but I would suggest changing it to either Bonesplitter if you want to close the game faster or Mutagenic Growth if you want to have protection vs Bolt (also more spells that flip Delver). Archeomancer is very slow. 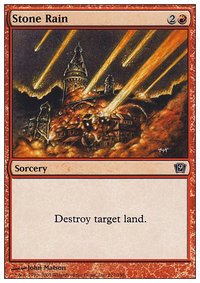 You have 6 spells in Daze and Deprive that bounce your land. I would go for Augur of Bolas. With so many spells you will almost never miss on his trigger. Too little creatures. Any starting hand without Delver of Secrets Flip in it seems quite bad. If opponent puts any >1 toughness creature (like Glint Hawk or Lagonna-Band Trailblazer) into play you will probably die to it. You also lack the ability to sneak the Ninja of the Deep Hours into play with ninjutsu. Delver decks usually use Faerie Miscreant and Spellstutter Sprite to put Ninja into play and get back something with etb trigger. You are mixing up two things. If you want to use Delver of Secrets Flip you are creating Tempo deck. That means you have to go down on cmc and get cards that can interact with opponent but also get in some points of damage, i.e Vapor Snag or Spellstutter Sprite - when you counter with Sprite you will kill opponent unless he does something about it, but when you counter with Counterspell you are not any closer to winning the game. If you want to create Controll deck, you don't even need creatures to win, however you need some way of interacting with things your opponent manages to put into play as well as some card advantage. 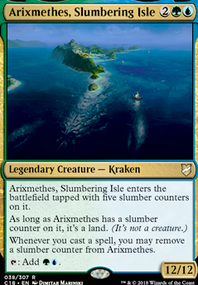 You can look up UR or UB control lists - they play a lot of removal like Chainer's Edict or Skred to deal with things they coulnd't counter and play things like Think Twice, Mystical Teachings, Accumulated Knowledge and so on to generate card advantage. You can even count not playing creatures as "card advantage" - their removal would be useless. shirouu- First, thank you for the uovote and thanks for considering my deck for a comeback! Yeah, the "No" factor of this deck makes it pretty aggravating to play. Mesmeric Orb- These are nearly 40% of the deck's cost. Unfortunately, also nearly indespensible to the deck's mechanics. Doing so much of the heavy lifting, I'm afraid there isn't any comparable replacement for their long-game potency. You may be able to replace these with some hard milling cards like Mind Sculpt, Tome Scour, Sanity Grinding, or Memory Erosion. All much cheaper than Orb, but will ultimately do less in the long run. Oboro, Palace in the Clouds- this isn't necessary to the deck. In fact, it's in this list, but I don't actually have one for it in paper. My one copy is in my Esper Salt Mill. This list does quite well without it. 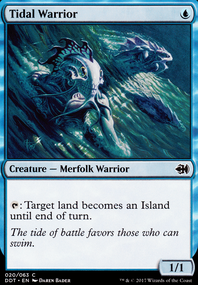 You could use Halimar Depths for some deck fixing, and it would work with Deprive and Hedron Crab in a defensive position but still add fuel to your wincon. Thing in the Ice Flip- This is still in testing. With only 2 in the deck, it's not a crucial card. More of a backup wincon should I face a go-wide token or weenie deck. You could do AEtherize, or fill in with one more of each Unsummon and Vapor Snag. I've even been considering Boomerang, so I can return their lands as well. On the low end of pricing, these cards are over 50% of the deck's cost. I'm not sure how competitive your meta is, but this will still be annoying in any capacity. 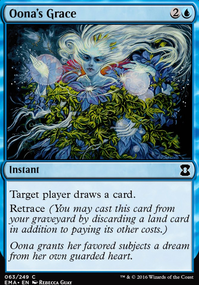 If you're playing more casually, you can always do a casual mill like Bigger Bluer Eraserer, this deck features 2 cards, not legal in Modern: Whirlpool Rider and Accumulated Knowledge. The other option to making this more effective with a budget, would be to add some more tempo. Mana Leaks, or other cheap disruption spells would simply buy you time to finish the job without the Orbs. Hope this helps!! And I sincerely hope you get to use this and win with it. It's a lot of fun if you really like being the troll at the table! Any more questions, or I can help, let me know!! Thought Scour is probably better than Opt, here. 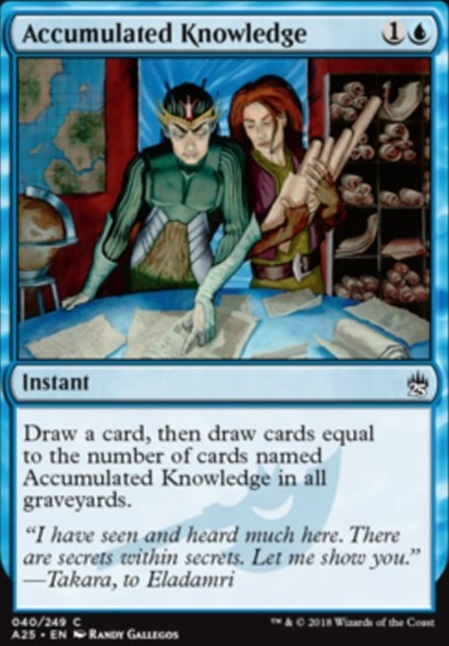 Also: If you're going casual format, anyway, Accumulated Knowledge is a strict upgrade to Take Inventory.